Future Market Insights (FMI) delivers key insights on the global biologic excipients market in its upcoming report titled Biologic Excipients Market: Global Industry Analysis 2013–2017 and Opportunity Assessment 2018 – 2028. In terms of revenue, the global biologic excipients market is projected to register a CAGR of 3.6% over the forecast period owing to various factors, regarding which FMI offers detailed insights and forecasts in this report. The global market is segmented based on excipient type, end user, and region. Based on excipient type, the market is segmented into polymers, sugar alcohols, polysorbates, inorganic salts, amino acids, surfactants, and others. Polymer biologic excipients are anticipated to lead the biologic excipients market over the forecast period. 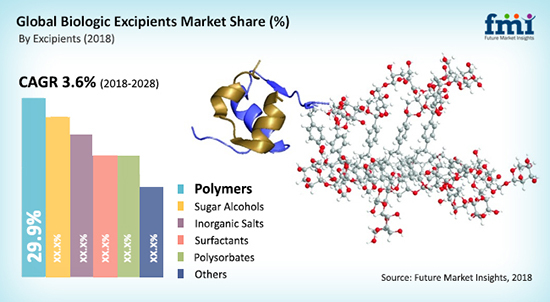 Polymer biologic excipients account for the highest revenue share and are anticipated to witness a growth rate of 3.7% over the forecast period. By end user, the market is segmented into biopharmaceutical manufacturers, contract research organisations/contract manufacturing organisations, and research organisations. Biopharmaceutical manufacturers is the leading segment in the global biologic excipients market over the forecast period. This segment accounts for a relatively higher revenue share, which is expected to register a CAGR of 6.0% over the forecast period. Growth of the global biologic excipients market is primarily driven by rising global demand for medicines, greater uptake of biologics driving demand for parenteral formulations, increasing acquisition of contract research organisations, patent expiration of major blockbuster drugs, growing adoption of advanced drug delivery technologies, increasing research in pediatric formulations, growing demand for extended-release or sustained release formulations, increasing demand for oral solid drug formulations, rising demand from emerging economies pushing local drug production, and increasing per capita healthcare expenditure. However, lack of proper data documentation on GRAS status of excipients, regulatory audits restricting supply capacity, regulatory hurdles deterring novel excipient development, and stability testing of excipients imposing cost liabilities on drug manufacturers are some factors expected to hamper the growth of the global biologic excipients market over the forecast period. A key trend witnessed in the biologic excipients market is increasing adoption of continuous processing of biologic excipients, dependence of large drug manufacturers on in-house biologic excipients production, vast proportion of imported excipients leading to production delays, and regulatory harmonisation with respect to gradation of excipients. Furthermore, the growing importance of developing biologic excipients by big players in order to enhance their product portfolio, growing importance for manufacturing authorisation, growing market for topical and parenteral applications and compulsory licensing promoting demand for biologic excipients are the key trends likely to be witnessed in the global biologic excipients market. The North America regional market is projected to dominate the global biologic excipients market, accounting for a maximum revenue share of the global market by 2017 end. The North America, Western Europe, and Asia Pacific markets accounted for 77.3% of the total biologic excipients market share in terms of value in 2017. Revenue from the market in APEJ is estimated to expand at a CAGR of 4.2% over the forecast period. Some of the key players featured in this report on the global biologic excipients market include BASF Corporation, FMC Corporation, Wacker Chemie AG, Evonik Industries AG, Ashland Global Holdings Inc., Archer-Daniels-Midland Co., Roquette Freres S.A., The Dow Chemical Company, Colorcon Inc., Signet Chemical Co. Pvt. Ltd. This report discusses the individual strategies followed by these companies regarding bringing improvements in their products, creating new manufacturing facilities, market consolidation and advanced R&D initiatives. The report concludes with key takeaways for players already present in the market and new players planning to enter the market. Get access to full summary @: https://goo.gl/TktSMw.